More than half the players on the Hawaii All-Stars readily volunteered for place-kicking duties prior to the team's first practice Wednesday at Farrington High School. Jimmy Higgins' name suits a country star more than a kid from a small Samoan village. When the Hawaii team of senior standouts arrives in American Samoa tomorrow, Higgins will be home again. Samoa Bowl III kicks off on New Year's Day, but the Hawaii squad departs tonight for a week of preparation and gritty cultural exchange. "We'll have practice in the morning, and in the afternoon, we'll build an umu," Higgins said of the underground oven, the Samoan version of a Hawaiian imu. As the team's offensive coordinator, Higgins is like many coaches who have participated in the annual trek. His roots come from Malaiini, though he moved as a teen and graduated from Kaiser High School. Getting the 35 or so players involved with daily umu work is something Higgins relishes. "We'll cook pig, taro, bananas, palusami, chicken. We've got people who donated four pigs already," he said. The more pigs the better. The squad includes some of Hawaii's top seniors, both in talent and girth. 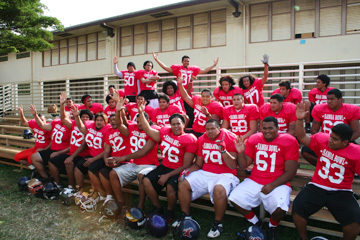 American Samoa won the inaugural game 13-12. Hawaii won last year, 20-8, with a pass-first mentality. Coach Siuaki Livai intends to keep the jet stream active with more aerial action. That won't be difficult with Saint Louis quarterback Cameron Higgins, son of Jimmy. "Higgins' accuracy is very good, probably the best we've had by far," said Livai, whose Kahuku squad recently won its fourth state title in six seasons. "It's hard for them to defend the pass. We'll go in, line up with a few plays and throw the ball." Other notable names include running back Kenneth Faumui and defensive standouts Tanner Fetui, John Sagapolutele and James Sagapolutele of Farrington, quarterback/defensive back Stanford Leti of Moanalua, defensive lineman Stili Malepeai of Aiea, two-way lineman Chris Maake of Pearl City, defensive lineman Kamalu Umu and linebacker Jared Silva of Saint Louis, defensive lineman Alasi Toilolo of Kapolei and defensive end Russel Fisher of Pac-Five. It won't be all fun and travel. There will be a lot of conditioning early in the week, along with double-day practices to get acclimated to the weather. Like many of the players, Higgins grew up in Hawaii. A few others, though, have been back to the homeland. Aiea's Joe Mauga has been to American Samoa twice. "I went when I was 7, and when I was 15. When you're there, you have freedom," the 5-foot-11, 210-pound defensive back said. "Where I'm from, you don't have to pay for anything. They treat you like royalty 'cause you're from Hawaii. You're more educated," he added. Mauga predicts that the Hawaii team, which includes non-Samoan players, will have a memorable trip. "It's gonna be fun for them. The hospitality, the way they treat you, there's a lot of respect," he said. Another Aiea senior, Josh Blakemore, is half-Samoan and has never been to the island. "I want to see what it's like. I'm expecting to have fun," the speedy 6-foot, 185-pound wide receiver said. What the players may not be able to anticipate is the way the audience at Veterans Memorial Stadium in Tafuna will respond when names and home villages are announced during introductions. "They'll eat breakfast and lunch together with the other team every day. There's always people that want to host our boys," team manager and unofficial "team mom" Iva Tiave said. Players pay for the airfare, but even with high costs, demand has grown. One player, Peyton Ma'o, has already flown in from Arizona to American Samoa. "Their parents want them to visit home. And every year, the boys end up sticking together. They don't want to leave each other even though they come from different schools," said Tiave, who is a counselor and teacher at Farrington. The team will also be feted by local politicians at dinners. It's the best of both worlds, a simple game with far-reaching relationships. "To me, this is my reward, playing a game for fun, giving the kids exposure to Samoa," said Livai, who has endured a share of controversy recently. In the aftermath of his team's state championship came a report of vandalism at Aloha Stadium in the Kahuku locker room. It's no wonder he seems far more relaxed with a small Samoa Bowl III team, bearing a track record of goodwill and good competition. His excitement extends to the Kingdom Bowl, as well. That game is played each July in Tonga between teams from Hawaii and the U.S. mainland. Extra points: Livai has plans to start a similar game in Japan. "We'll split the talent between Hawaii and Japan so the teams are mixed," said Livai, who would like to kick the game off in 2007. ... Other assistant coaches are Tony Tuioti, Sam Papalii and Alema Te'o.